Have a classic, bold look for your Apple watch with Nomad Horween Leather Strap! Expertly crafted from the finest vegetable-tanned Horween leather, this Traditional Build leather strap is designed to give your Apple watch a unique look that youll love to wear. It came from one of the oldest tanneries in Chicago, USA, which offers unparalleled blend of quality, consistency, responsiveness, and innovation. Each strap is lined by a soft leather backing held together by a linen thread. This pre-stretched and beeswaxed thread by the renowned French thread-maker Fil Au Chinoishelps maintain lasting integrity and prevents the leather from stretching and morphing through months of wear. This is the same thread that's found in traditional artisanal saddlery as well as in brands such as Herms. CLASSIC & TIMELESS: Old-world artisanry meets new-age manufacturing. 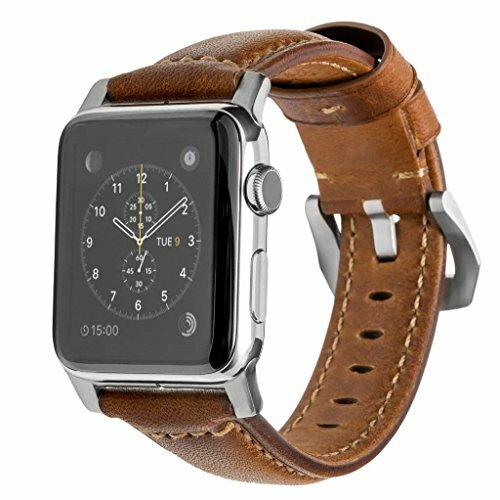 This Traditional Build leather strap is designed to give your Apple Watch a classic, timeless look that's uniquely yours. PREMIUM CRAFTSMANSHIP: Each strap is lined with a soft leather backing held together by a linen thread. This pre-stretched and beeswaxed thread by the renowned French thread-maker Fil Au Chinois helps maintain lasting integrity through months of wear.